Select GOG bundles are being discounted up to 80 percent until January 2nd. 2013 is coming to an end today and GOG wants to help close the year in style with its new "Let's Party" promo. The promo, based off of bundle votes from its recent Winter Sale, will feature discounts up to 80 percent and will run for until January 2nd. The bundles included in the new promo will be the ones that users voted against during the recent Winter the sale and should include something for just about every kind of gamer. Do you like games where you fly planes around and blow stuff up? You can snag the Military Combat Sims bundle for $11.12. Want enough role-playing content to last you through 2014 (and then some)? 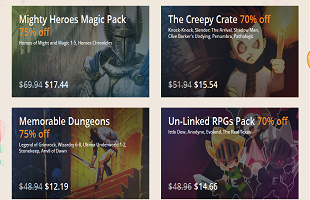 Buy the entire Ultima series for $7.45. There are 15 bundles in total, all of which are arguably excellent bargains. Of course, this new promo isn't quite as widespread as the site's recent Winter Sale but, even so, it arguably makes up for its limited range with low prices. My retro library and overall backlog is already pretty big going into 2014, but I'm still having trouble looking at some of the deals being offered without adding them to my cart. What do you think? Will you ring in the new year with a GOG purchase or are you going to pass for now and see what 2014 brings?